What if you can bring together all the best latin street foods in the world and place them in a seductive restaurant? Named after the fictional town from one of my favorite books One Hundred Years of Solitude by Gabriel Garcia Marquez, Macondo brings a new form of freestyle Latino cuisine while adding flair to traditional street foods from Latin America and Spain. Though the food is customized, it maintains the essence that makes these dishes world renowned. The decor is awesome and made me instantly feel comfortable. Macondo has a modern Latin style and lends a market feel by using typical Latin food products as part of the decoration. This seems to be a trend. Check out Kuba Kuba in Richmond. We decided to eat tapas style so everyone could taste each dish. The papas bravas (mad potatoes) were fried great. Just the right layer of crispy on the outside and the spices seemed to seep inside to create an all around perfect papa. with rich aioli sauce layered to make an exceptional start. On to the quinoa salad. Quinoa is a highly nutritious grain that is native to the Andes. Throughout history, quinoa was never fully accepted by Europeans and so never became popular. As noted in google trends, quinoa is finally starting to get the attention it deserves. The size and popping remind me of fish eggs though it tastes like a combination of couscous and rice. Macondo prepares it just right. I don't want to brag but everyone's favorite entree was by far the Colombian inspired breakfast. Though not authentic, the Benedict Colombiano had the right elements of a traditional arepa breakfast plus some unique ones that are unusual for a Latin restaurant. Either way it was ridiculously amazing. The toasty corn arepa was topped with smoked salmon, poached eggs and safron lemon allioli. I would swim across the east river to get my hands on the recipe for that allioli. 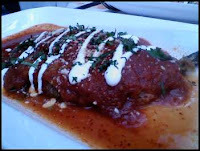 Second favorite were the enchiladas de pollo in sweet poblano mole sauce, this time Mexico comes in second place. Sorry Jaquie. The mole really did make this dish exquisite. I don't recall but I might have dipped my finger in the leftover sauce and licked it. Oh c'mon like you haven't done that before. In third place but still really pleasing were the chilaquiles with chicken and salsa verde (green) topped with cream cheese. Chilaquiles were a first time for Carlos, not really a big fan of soggy tortillas. Truth is you have to eat them hot and this dish came out warm. Cream cheese may also have been an easy way out. The isla mangu, which we all thought was going to take the gold medal was acceptable but not exceptional. Carlos pointed out that the mangu tasted like mofongo. Mangu is usually mashed boiled plantains served with sausage and cheese. Mofongo is mashed fried plantains mixed with bacon bits and other ingredients which is what Macondo's "mangu" closely resembles. We had churros with blueberries and a side of hot chocolate for desert. A favorable way to close of the meal. Overall, Macondo respects the traditional street foods of Latin America while customizing every element in a commendable way. The environment is fun, the people are nice and satisfied faces draped the dining tables. We met the manager and he recommended we visit Macondo's sister restaurant, Rayuela. I took a glance at the menu and immediately two items stood out. Oh yea... Rayuela deserves a visit. All week i have been craving chile relleno; though I have only had this delicacy once or twice before, I was lucky enough to randomly choose a place that serves them delicious and authentic. That's the great thing about a Mexican girlfriend. You'll always know whether or not you're eating the real thing. 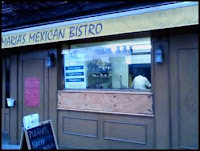 In search for a Mexican cafe in Brooklyn that no longer existed, we decided to take our chances on this rather large and dim lit restaurant. The staff was great and attentive. They even opened up the back patio to seat us in a better-lit table. Decor was interesting, one thing that I liked were the open market sacks of chiles as we walked to the table. Shakira was playing in the background and just as we began to make fun of the music, two musicians began to play a guitar and a harp. I won brownie points by telling Jaquie that harps only come out in the presence of angels. Gotta love the cheesy lines. Speaking of Cheesy, we had cheese dip that we think may have had some canned ingredients and, unfortunately, the type of cheese used was just regular mozzarella. It was still tasty. 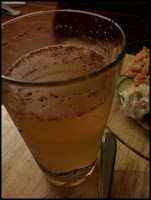 Jaquie’s favorite customized beer, the michelada, is starting to grow on me and Maria’s Bistro makes it quite good. Compliments of the house, some sauteed zucchini with garlic. Two thumbs up. 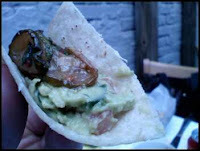 I decided to top it on the guacamole, which was mashed fresh to perfection and served with fresh tortillas. Good stuff! Since we weren’t too hungry we decided to just order some appetizers. We split an order of sopes, which are made of thicker tortilla type dough topped with steak or chicken, beans lettuce and sour cream. 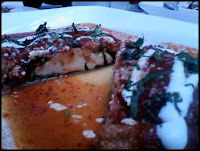 This was average at best and completely overshadowed by the star of the meal, the chile relleno. The texture of this mild chile poblano makes the perfect encasing to hold the warm thick cheese. Batter-fried to add some crispiness and topped with tomato sauce that is spiced just right to compliment the main ingredients. If my taste buds were a web browser I would quickly add this to my list of favorites, I suggest taking a trip to park slope, BK to try the chile relleno at Maria's Mexican Bistro. So good it deserves two pictures. Looking back when I was 17 and I declined the invitation to go to Chile with my parents so I could stay home alone. I still want to slap myself, especially now that I have experienced Chilean food first hand. 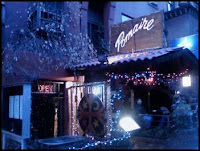 Pomaire, named after a Chilean town known for its pottery, is the only Chilean restaurant in Manhattan. Add that to the fact that it's located on restaurant row in the heart of NYC's tourist area, and you have a recipe for success. Last Saturday, Jaquie and I entered the dim restaurant for a late lunch to notice we were the only customers. I thought to myself, "Is this place bad?" I hadn't read many reviews, and the staff acted like we had caught them with their pants down. At this point we nearly turned back, but instead I asked "Are you open?". We were then greeted by the Chilean version of Rico Suave that even seemed hesitant to give us the table we wanted within an empty restaurant. I let it slide and hoped that the poor welcome did not reflect on their food. As we looked over the menu, we snacked on some amazing home made bread that was paired with Pebre, an acidic and spicy salsa made with Chilean spices. Make a note to try the pumpkin bread… it’s a very unique experience. Open Sesame!! Kitchen doors opened and as the food was prepared, the staff seemed to warm up along with it. We had decided on the beef empanadas and ceviche for apps. 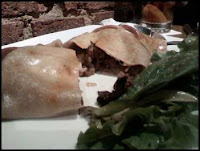 The empanadas were the largest i’ve seen with a very thin dough on the outside and stuffed with interesting ingredients such as olives, raisins and boiled eggs. Add some pebre, and you can’t go wrong. The mixed seafood ceviche called Mariscal was a party of different seafood in one. It was a wise choice. The shrimp, clams, mussels and scallops were mouth-watering especially when slurped up with a spoonful of onion and spicy juices from the bottom of the bowl. 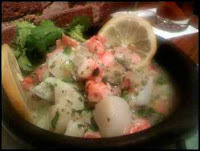 As my main dish I had traditional Chilean seafood chowder. A seafood after party with more of the market fresh mussels, shrimps, and scallops served in a clay pot (hence the name of the place) with chanco cheese, which is very popular throughout Chile. Jaquie had the roasted pork loin with a mushroom crab cake and roasted potatoes topped with mushrooms and a regional mushroom sauce. While very delicious, it wasn’t really the highlight of the meal. We took a break before dessert, and Jaquie had some wine while I tried a pisco sour which is a brandy distilled from grapes…pretty tasty. We then realized that the early dinner crowd appeared out of thin air. I guess our food gave us a sort of tunnel vision. 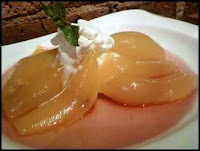 The dessert, papayas in syrup, was my favorite discovery. Though it carries the same name as the papaya that most Latin food lovers know, this fruit has the texture and amazing taste combinations of mangoes, peaches and YES papayas. Jaquie chose a meringue dessert that was layered with a popular Chilean sweet cream resembling a layered cake. The crunchy texture of the meringue a nice surprise that just melted in your mouth. 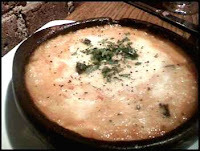 Needless to say, Pomaire does a great job at being the sole representative of Chilean cuisine in New York City. Though a bit pricey, it requires a return visit. 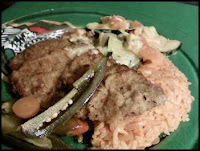 Jaquie and I decided to stay in and replicate Milanesa ala Mexicana with a side of calabasitas and yummy orange rice. Gotta love Mexican rice! Milanesa is the original version of what you may know as the Chicken fried steak. This lightly breaded, thin cut of beef is known as Chuleta Empanizada in typical Colombian restaurants. For a while as a teenager I was blind to anything else on the menu. So much so that Papa Hoyos used to surprise me with chuletas on a regular basis. I could NEVER refuse. Can you blame me? Milanesa became very popular throughout Argentina, Chile, Uruguay and Bolivia because of immigrants from Milan, Italy and somehow made its way north to leave a footprint in Mexican menus as well. When making it at home, we simply patted the steaks dry, coated them in flour, dipped them in some beaten eggs and covered them in seasoned breadcrumbs. They were fried with just enough oil to make them nice and crispy on each side. As a side, made with zucchini, jalapenos, onions, tomatoes and cheese, Calabasitas are light and delicious veggies that work well paired with any meat. The rice is an art form perfected by Jaquie and her family who refuse to use a rice cooker. Fresh out of the frying pan, the Milanesa melts in your mouth and makes you wonder if there is a better fried food out there. Finally, the Michelada! for some it can be an acquired taste. Beer is prepared with lime, salt and a chile powder of some sort. Refreshing and paired with the Milanesa makes a Perfect combination!